Select wheel Rim size: 4" | 5" | 6"
These centrifugally-molded polyurethane tires are the optimal solution for large-wheeled combat robots. 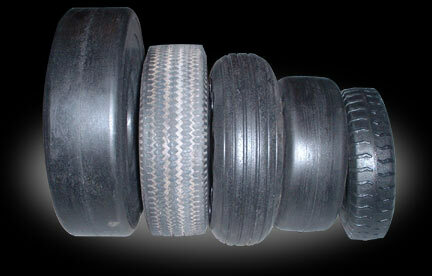 BattleTreads are a solid, one piece tire - no air to leak out, no tube, not a heavy foam-filled rubber tire. This means that the tire is amazingly lightweight and nearly indestructible. These tires have been used with great success on many of your favorite robots... Toro, T-Minus, The Matador, Nightmare, The Judge, Mechavore, Vladiator, Vlad the Impaler II and many more. Minimum order is 3 tires. Mix-and-match sizes if you need to, as long as your total is at least 3. If you order fewer than 3, your order will be rejected. Jump to Rim size: 4" | 5" | 6"
* CareFree tires can be machined or cored out to achieve any size, profile, or weight. You can even drill holes all the way through if you wish. * Carefree tires do not delaminate and jam up in your robot when cut apart like foam filled tires. They are also far lighter than foam-filled tires. They are even non-marking and oil resistant. * There are many hub solutions avaliable for these tires as they are all made as replacements of commercially available air filled tires. Azusa, Douglas and Skyway all make very good rims. These are readily available from most Go Kart retailers. * All tires are shipped directly from CareFree to you. If the tires are in stock they ship in 1-2 days otherwise they have to make them and they take up to 2 weeks (but usually sooner). Note that these tires are all specially designed for robot combat related applications, you can not order them directly from Carefree. We are one of the only authorized distributors of these robot tires. * For highest traction, we recommend removing the outter slick layer of the tire. This can be done on a lathe or by turning the tire on the robot and using a grinder or sander. There are also foam tire traction compounds like Trinity Death Grip that help. * Please note that the "OD" or Outside Diamter specification in the charts above, is a maximum number after being mounted on rims. As different rims cause the tires to expand different amounts, this number may vary by as much as .25". * Carefree Tires are Made in the U.S.A. The shipping amount that is calculated by the shopping cart system may vary slightly for the actual shipping cost on Carefree Tires. If the difference is significant, we will contact you before processing the order. CA residents will be charged sales tax for Carefree Tires. This tax amount will be added post-process of your order.